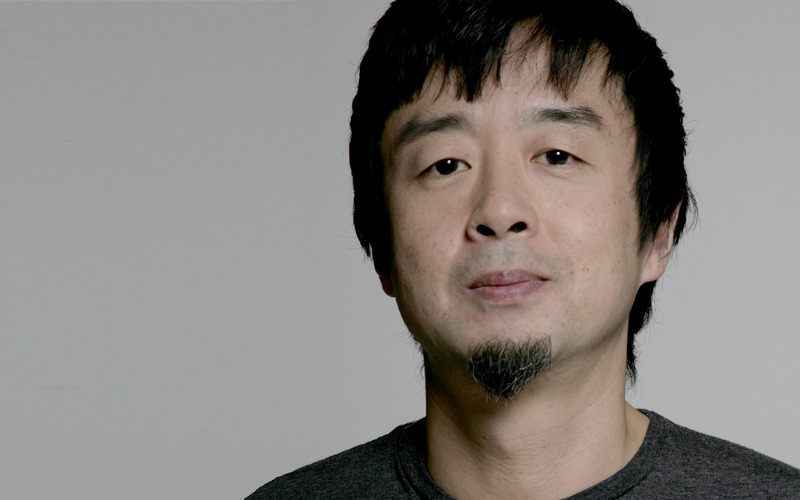 Jum Nakao is a Brazilian Designer and Creation Director. The grandson of Japanese immigrants, he lives and works in São Paulo, where he has a studio. Initially interested in working with electronics and computing, he gave up on the idea, as he wanted something with a more human perspective. It was in fashion that Jum found his calling, and he started studying the subject in 1984 at CIT— Coordenação Industrial Textil (Textile Industrial Coordination), where he made his first contacts with area professionals, such as the educators Vera Lígia P. Gilbert and Marie Ruckie. In 1988 he took the Fine Arts course at FAAP– Faculdade Armando Álvares Penteado, followed by third-level extension courses in the History of Dress, at the Instituto de Museologia de São Paulo, and in the History of Fashion, under Professor Serafina Borges do Amaral, at SENAC. In 1996 he was considered best newcomer at the 6th Phytoervas Fashion Awards and was hired as Style Director by ZOOMP, one of the largest fashion companies in Brazil, where he stayed for the next six years. In 2002 he was invited to join DuPont as designer/partner on the Hotel Lycra International Project. In 2003, for the first time ever, fashion was included in the ‘Imagetica’ Art and Photography Exhibition, which featured an installation documenting the development of his Tribute to the Brothers Quay collection. The graphic design work by the studio Lobo Design—the books Future Kitsch and Tribute to the Brothers Quay—earned numerous international awards and mentions from the likes of The One Show (USA), “How Design” (USA), “Creative Review” (England) and ADG (Brazil). In 2004, the Bank of Brazil commissioned a campaign to forge closer ties with art, fashion, film and dance. The project featured directors of art, photography, advertising and dance companies. Jum Nakao was hired as art director on the concept and costumes. That same year he signed on as Creative Director for one of the most traditional womenswear companies, VIVAVIDA. In 2004, for the first time in the company’s history, the sportswear giant NIKE—global leader in its segment in terms of turnover—signed a worldwide contract with a designer on a premium line: JUM NAKAO for NIKE. He was invited by FAAP, ABIT and MASP to be Creative Mentor on the Brazil Institute Art and Fashion project. During São Paulo Fashion Week in 2004, Nakao’s runway ended with the models tearing up intricate dresses made out of laser-cut vegetable paper, the result of 700 hours of work. After the Fashion Week performance, he participated in the “Art and market” exhibition at Galeria Vermelho in São Paulo, where he showed “Well of Wishes”. In 2005, the designer was invited by the TV director Luiz Fernando Carvalho to design the ‘Royal Court’ animated sequence for the TV Globo miniseries Today is Maria’s Day. That same year Jum launched the book and DVD Sewing the Invisible during São Paulo Fashion Week. Published by SENAC, the book/DVD is based on Jum’s Summer 2004 runway show. In June 2005, he held a fashion show and exhibition at Galeries Lafayette in Paris as part of the Year of Brazil in France. To commemorate ten years of fashion in São Paulo, Sewing the Invisible was selected Runway of the Decade during SPFW. In August 2005, Fashion made its debut at SESC’s Cultural Shows and Jum Nakao was invited to create and hold the exhibition “Paths and Conflicts”. 2005 was also the year the designer put his name to tennis star Guga Kuerten’s clothing label. In 2006, in partnership with Curtlo, he launched the handbag line Curtlo by Jum Nakao, which was selected for the 1st Brazilian Design Biennial. In January 2006 he was invited by Musée Galliera’s international curator Anne Zazzo to take part in an International Exhibition at the Paris Museum of Fashion on the most notable works of couture from the 20th Century to the present-day. In July 2006, Jum launched the collection OXTO-JUM NAKAO. That same year he was creative director on the Jocy de Oliveira opera Kseni. By invitation of the Museu de Arte Brasileira he designed the set for the exhibitions GRAN SERA and Routes. Nakao exhibited the installation REVOLVER at the MON—Museu Oscar Niemeyer in Curitiba in May 2007, followed, that October, by the exhibition Brazilian Design—A Changing Gaze, held at Itamaraty Palace, home to the Brazilian diplomatic corps. Also in 2007 he assumed the position of creative director at NUTRISPORT. That November, his Urban Landscape featured in the exhibition Transitory Homes at the Museu Nacional. The year 2007 also saw him join the Molina Remix exhibition with the installation What the eyes do not see. In 2008, he was invited to hold an exhibition entitled The Enchanted World of Jum Nakao at the New Zealand Art Festival, as part of the commemorations of the 1st anniversary of the The New Dowse Museum. That same year, Yuko Hasegawa, curator of the Museum of Contemporary Art Tokyo, invited Jum to feature in the exhibition When Lives Become Form: A dialogue with the future – Brazil/Japan. That same year Jum was asked to create the concept for the Japanese Immigration Centennial Pavilion. Soon afterwards, he exhibited at the Della Creatività Festival in Italy. His installation Tear was shown in the Nipon Exhibition at the Bank of Brazil Cultural Centers in Rio de Janeiro and Brasília, and he created and curated the exhibition Reproduce, held during the 2008 Viver Design Week in São Paulo. His Multi-prismatic Dresses performance was hired for the launch of Oi Telecom’s cellphone operator in São Paulo. Still in 2008, he was invited by Itaú Cultural to participate in the mega-installation PETS, which occupied the Tietê River in São Paulo. In 2009 he was asked by the Euro-Brazil Council to take part in the Milan Design Fair as director of the projects Mobile Forest and COCAR. In 2009, Coca-Cola Inc. hired him as art director in charge of developing the characters for its Kuat Eco campaign, while Nespresso commissioned the worldwide launch of its Premium coffee Singatoba, for which he created a kinetic mural over six meters long. He was the name chosen by the curators of the Sabbioneta Art Festival for the Fashion Intellectuals section of the show Please me Fashion, held in Mantova, Italy, where he exhibited the work luxdelix. The show ran from June 6 to July 18, 2010 at the Palazzo Ducale. Also in 2010, the São Paulo Dance Company invited Nakao to develop the costumes for a staging of THE DOUBLES. His installation and performance Wearable Vestiges, produced by Cinnamon Comunicação and held at the Bank of Brazil Cultural Center in São Paulo in June 2010, during the 20th edition of SPFW, became a milestone in mediation between the worlds of Fashion and Art. In November 2010, by invitation of the Ministry of Culture, Jum took part in the Brasilidades project and installed his Dream of Darcy between the pilotis at MAM—Museu de Arte Moderna in Rio de Janeiro. He was invited to conceive of the space for the Salon Design 2011 at the Casa Brasil in Bento Conçalves, the most important event on the Brazilian furniture industry’s calendar. At the 26th Casa Cor, in 2012, the designer, the recipient of that year’s tribute, was asked to create the Jum Nakao Space. He was also invited to join the jury for the IF Concept Design Awards in Hannover, Germany. He created and executed the Reality Project during Dragão Fashion 2012, in partnership with Senac. This was the first time in history that a complete collection was developed in real time during a fashion week. At the launch of Senac’s new corporate identity he was invited to create a Biennial Book-Fair Stand for the SENAC publishing house. Jum was the designer in charge of the Brazilian section of the closing ceremony at the London Olympics in 2012. That same year he exhibited his Portable Memories, Boxed Dreams at Somerset House in London. In October 2012 he participated in the opening of the Futurotextiles exhibition at CETI (European Centre for Innovative Textiles) in Lille, France, where he showed the work Cloud Dress. In 2013 he launched the Schuster-Jum Nakao furniture line and won the ABRIGRAF Graphic Excellence Award for The Time of Brazil, the Reality Project catalog. Jum was creative mentor behind the maiden edition of Patio Batel Fashion Week, held in September 2013, for which he conceived the installation Dream on Patio Batel, made with over 130 thousand balloons. In April 2014, he exhibited the work Ephemeral Fountain in the central square of Victor Civita Park. Jum designs furniture, clothes, and spaces; works as creative director on films, events and shows; delivers lectures and workshops and holds exhibitions both in Brazil and abroad. He is a reference in all the most important publications on Fashion and Design, and his work can be found in the international collections of many museums of art and fashion worldwide. In his production, Jum Nakao manages to combine digital technology with the sophistication of unique handcrafted pieces, blending the dramatic, fairytale feel of 19th-century couture with the perky universe of the playmobil doll. As Lautréamont once said (creating a surrealist slogan in the process), “As beautiful as the chance encounter of a sewing machine and an umbrella on an operating table”, Jum Nakao goes on dissecting the world and sewing the unpredictable.